All The Breaks v1 is an incredible addition to your sound library. This record features an impressive collection of 100 original & sought after breakbeats, sourced and remastered from the original records, and then cut down to the essential parts. 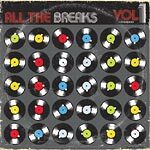 Instead of featuring full songs or repetitive loops, All The Breaks only features the open breakbeats sections from these classic tunes, compiled for your convenience. Forget about sample CDs and data discs that attempt to recreate the sounds featured in this collection; if you're looking for drums, All The Breaks is all you need. Thanks to several Hip- Hop luminaries and pioneers, most of the drums heard in this archive have reached timelessness and are just as relevant now as they were during Hip-Hop's golden era.